February 10 ushered in the Chinese year of the Snake. Ancient Chinese wisdom says a snake in the house is a good omen because it means that your family will not starve. Although we prefer to keep our snakes outside, they are fascinating, beautiful creatures and help to rid the environment of pests like rats and mice. Our local snakes are still hibernating but will begin to appear as the weather warms. Two varieties — copperheads and Eastern timber rattlesnakes — are venomous and are to be avoided, although even they will not strike without provocation. The other four varieties — black rat snakes, garter snakes, milk snakes, and water snakes — will not harm you. Some local non-venomous snakes are often mistaken for the dangerous varieties. The information and pictures below may help you to avoid such mistakes. The adult black rat snake can grow as long as six feet and is an impressive creature. It eats mostly mice and rats and in the early spring you may meet one sunning itself on the road. Black rat snakes can kill copperheads and rattlers while defending their territory; they are immune to their venom. 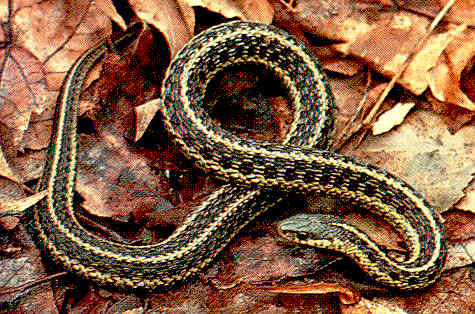 Our most common snake is the Eastern garter snake, which usually has three yellow stripes. These can grow to be three feet long, but the ones you meet hunting or basking during the day are generally shorter. The water snake, found locally in rivers, ponds and lakes, is frightening looking but not venomous. 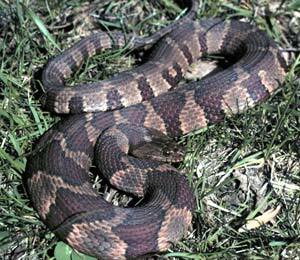 It can be up to 42 inches long and is sometimes mistaken for a copperhead. The striking-looking milk snake, a variety of king snake, is often mistaken for a copperhead. The confusion comes because milk snakes have a grey to tan background with black-banded brown blotches. 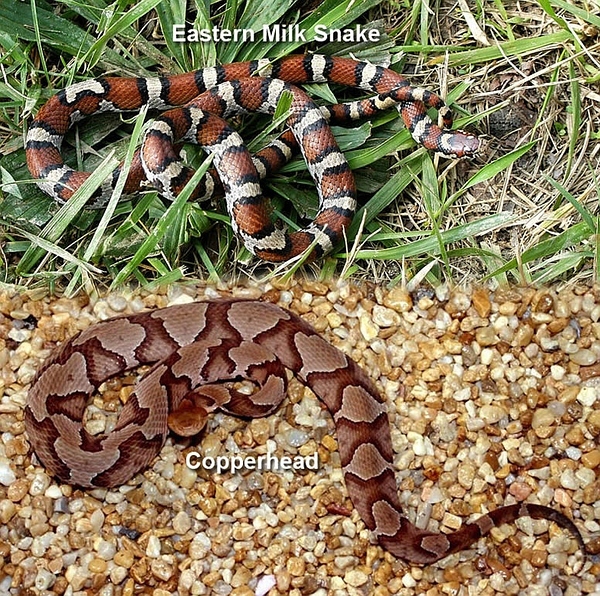 Copperheads also have tan blotches, but those on a milk snake are rounded or square while those on a copperhead are hour-glass shaped, and truly copper-colored. 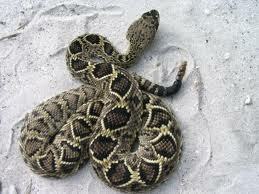 Milk snakes eat rodents and also kill copperheads and rattlesnakes. They can grow to be three feet long. Our rocky, wooded area is ideal hunting ground for copperheads and the few rattlesnakes who still live here. The copperhead is two to four feet long, with a thick, heavy body. Its bite, although painful, is usually not fatal to adults. Copperheads prefer to hunt at night but sometimes bask on rocks in the sun during the early spring and fall. During hot days they often hide in rocky crevices.